The Commercial range of high quality analogue wall clocks are available with 26, 32 or 44cm diameter dials and have an elegant case design that is available in a choice of colours. Movements are available for battery powered quartz operation, mains powered quartz operation or as a slave clock controlled by a master providing 24v one minute alternate polarity impulses. 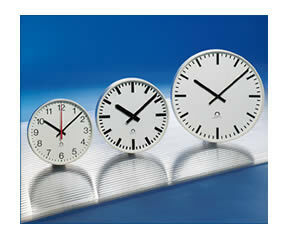 All models have white dials and black hours and minutes hands and are available with Arabic numbers. Battery powered and mains powered clocks have red seconds hands. 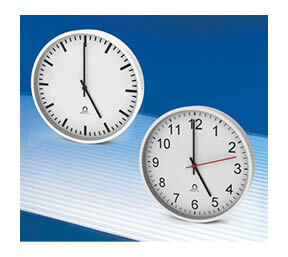 Dial sizes: 30 & 40cm - 11.8" & 15.7 "